In the hands of jewelers, gold can be fashioned into rings and pendants of long-lasting beauty. But, when reduced in size to nanocrystals containing a few thousand atoms, this noble metal is a surprisingly good catalyst. Finding the key to gold’s chemical reactivity (or that of any metal nanocrystal) has been difficult, as few measurement techniques work at the nanoscale. Now, researchers at the University of Illinois have demonstrated a sensitive probe that can identify and characterize the atomic structure of gold and other nanocrystalline materials. “Without the necessary structural information, our understanding of nanocrystals has been limited to models that often treat the surface of a nanocrystal as an extension of a bulk crystalline surface,” said Jian-Min (Jim) Zuo, a professor of materials science and engineering at the U. of I., and corresponding author of a paper to appear in the April issue of the journal Nature Materials, and posted on its Advanced Online Publication Web site. “The striking difference we found between the surfaces of gold nanocrystals and bulk crystalline surfaces shows we need to re-evaluate our preconceptions about the nature of structural dynamics and the level of complexity that nanocrystals can embrace,” said Zuo, who also is a researcher at the Frederick Seitz Materials Research Laboratory on the U. of I. campus. Because chemical reactions primarily take place on surfaces, scientists need to know how atoms are arranged on those surfaces. While scanning probe microscopy works for flat surfaces of bulk crystals, a different technique is required to study the surfaces of nanocrystals. 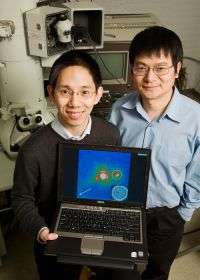 In their study, Zuo and colleagues used a technique they developed called nano-area coherent electron diffraction. The technique works by illuminating a single gold nanocrystal (about 3 nanometers in diameter and containing close to 1,000 atoms) with a coherent electron beam about 40 nanometers in diameter. The electron beam is scattered by the atoms in the nanocrystal, resulting in a complicated diffraction pattern made of speckles – similar to what is seen when a laser beam is reflected by a surface. When deciphered, the diffraction pattern describes the structural arrangement and behavior of the atoms, and the number and lengths of chemical bonds in the nanocrystal. The differences come as a result of the surface atoms being contracted. The force behind the contraction is attributed to the smoothing of surface electron density and a resulting electrostatic force that pulls the surface ions toward the remaining bonds. What is surprising, Zuo said, is that the contraction depends on the crystal facets. Atoms on facets with fewer bonds dominate, and lead to a much smaller contraction on other facets. This behavior is markedly different from bulk crystalline surfaces, and represents a new pattern of structural dynamics for nanocrystalline materials.